The Beal Opera 8.5mm Golden Dry is a top spec triple-certified climbing rope for advanced sport climbing, ice climbing and mountaineering which is fully equipped for extreme weather conditions. The Beal Opera 8.5mm Golden Dry is rated as a single, twin and double rope and offers on-point handling, minimal sheath slippage and superb weather protection thanks to Beal's unique Unicore construction and Golden Dry treatment. The Opera is also one of the lightest triple-certified ropes on the market, weighing in at only 47g per metre and making it a true multi-discipline rope for the expert climber. 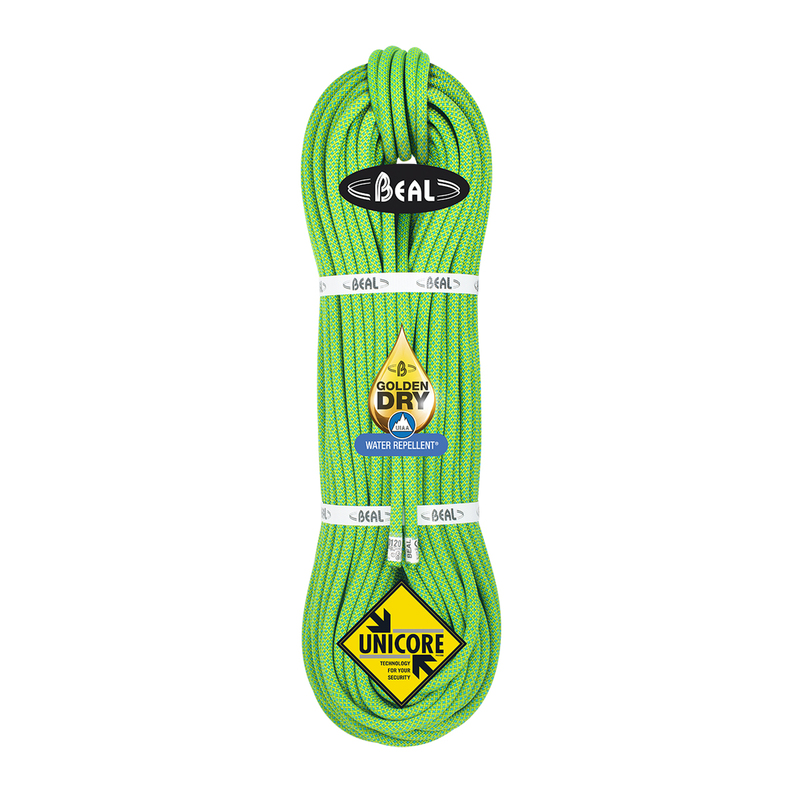 The Beal Opera 8.5mm Golden Dry Rope features Beal’s unique Unicore Technology, which bonds the sheath and the core of the rope together, drastically reducing sheath slippage and making your rope much safer to use. The Unicore Treatment means that you can still safely rappel or abseil to safety if the sheath of your rope gets cut, as it won’t slip or bunch up, which causes it to become impossible to pass through your descender. All ropes on the market have their date of manufacture printed on them. If you would like to know the date of manufacture of the rope before you buy please contact a staff member via the chat window. At a mere 48g per meter and rated for Single, Double and Twin the Beal Opera 8.5mm is one of the most versatile ropes we sell. A pair of these should cover you for all climbing applications apart from heavy sport climbing use where you take repeated falls. This is a very lightweight rope and it handles easily. It takes a long time to break in before it's smooth enough to handle without kinking a lot when being handled. But once you get it smooth it's really nice to work with.